Join our Webinar: Big Data and the 7 Societal Challenges Out-of-the-box technology for the future. 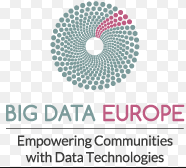 As the Big Data Europe project enters its second year, we’re doing everything we can to make it as simple as possible to get acquainted with the platform which is under development, and facilitate future deployments of our platform to support your Big Data pipelines. We are therefore happy to introduce this quarterly series of technical webinars, where you can keep track of progress related to our technical developments and demonstrators in each of the seven societal challenges, ask questions, and provide valuable feedback. In addition, we will also cover other important developments in the area which are not necessarily related to our project. The one hour webinar is run by the Big Data Europe Project and presents inputs and presentations from experts responsible for the architecture, the implementation and the upcoming pilots roll-out. The audience will be given a chance to interact and the top questions will be answered by one of our dedicated technical and domain experts. Registration is Free, click here to register now!